Crane Field and Remuda host various public tournaments and welcome commercial sponsorship. On-Course sponsorships include 4-5 hours of booth space at a tournament, a tee sign, and your organization name on event printed materials and digital ads. Sponsorships must be paid in full prior to the event for guaranteed participation. The pricing fee is dictated by each specific event. WHY WOULD YOU WANT TO SUPPORT A TOURNAMENT EVENT? The number of sponsorships is limited to keep the keep the best pace of play. 5 On-course Sponsor booths are allowed and 5 Passive Sponsors (money, marketing, and in-kind donors). The staff will help you deliver your supplies to the tee box out on the course. There are rarely extra carts available to go back and forth. Plan on a stretch of 4-5 hours before the tournament ends. If you have specific needs, such as moving oversized objects, parking vehicles, motorized equipment, banners, and so forth. Please discuss these with management beforehand so we can make the necessary arrangements. IDEAS FOR ON-COURSE GOLF TOURNAMENT SPONSORSHIP. Business and brand exposure with free logo merchandise giveaways. Capture leads with a business card drawing giveaway. $100 bill is always a hit. Sports memorabilia is popular. Capture names/phone/email with a freebie giveaway or game like spin the wheel, Plinko, or raffle drawing. Park branded awnings, flags, signs, vehicle wraps, etc. in the parking lot. Set up your booths at the staging area or clubhouse before and after the event for extra exposure. Take photos and send prints or post online. IDEAS FOR PASSIVE GOLF TOURNAMENT SPONSORSHIP. Pay for one of the player perks at the tournament. “Range balls sponsored by ABC Mortgage” for example. Ask the coordinators to put signs announcing your sponsorship. There are many different extras that a sponsor could provide such as hole-in-one insurance, trophies, drinks, lunch, range balls, music, swag bags, etc. Provide branded golf merchandise for the swag bag. 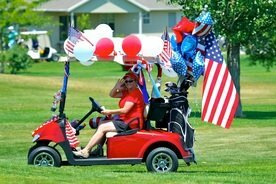 Most tournaments include a goody bag for golfers to take with them on the course. Put in things that golfers will use multiple times. Ask coordinator to put up signs or notes in the bags announcing your sponsorship. Promote the event with signs on your business property and bulletin boards. Promote the event on Facebook and email. Passing around sign-ups in your businesses and organizations. If there is enough meaningful exposure of the event, it will result in coordinators including you as a sponsor on signage and event materials. Try to entertain the golfers. You can not go wrong with that theme. The more unique your game or giveaway the better for golfers. If they play a lot of tournaments they may have a lot of logo pens and frisbees already. They may respond better to something a little more novel, such as a logoed golf glove, or logo socks, for example. Expect a 4-5 hour event with 80-120 players on average. Bring your own folding awning or umbrella to stay cool. Brink a collapsible table and chair for comfort. If you are not good at entertaining, it’s ok to have interesting conversations about your product. Be yourself. Offer a refreshment. Golfers have a hard time resisting something like a snack or cold lemonade. Your next step is to contact the clubhouse right away to reserve your sponsor request.